The Toyota’s 4.7-liter V8 engine is a well-known member of the UZ family. The 2UZ-FE engine was developed with a purpose of using in big trucks and SUVs. That is why it has more significant displacement, low-rev, and high-torque output. The 1UZ-FE and 3UZ-FE has aluminum cylinder block while the 2UZ-FE engine had a cast iron block - more reliable and cheaper material. Unfortunately, it severely affected the weight of the engine. But in the rest, the 2UZ engine block has the similar design and dimensions except increased bore and stroke. It also has a 90 degree 'V' angle, the 21 mm cylinder bank offset, and bore pitch is 105.5 mm. The engine has a steel crankshaft with eight counterweights and five main journals (the 1UZ crankshaft has six journals), forged and sintered connecting rods, aluminum alloy pistons with skirts coated with tin plating for a friction reduction. On top of the cylinder’s bank, there are aluminum heads. Each one has intake and exhaust camshafts, four valves per cylinder. The engine got the same method for camshaft rotation - the intake camshafts are driven by a timing belt, the exhaust camshafts are driven by gears on the intake camshaft. The design of the valvetrain for 2UZ is the same as for 1UZ. The exhaust and intake valve located on opposite sides with an angle of 21.55 degree. The diameter of the intake valves is a 34.5 mm, the exhaust valves have a 29.0 mm diameter (The sizes of diameters are identical to the later version of the 1UZ-FE with VVT-i). The engine has steel solid valve lifters, so valve clearances need a periodic adjustment. The early versions of 2UZ-FE had a simple aluminum intake manifold with a long intake manifold port. The engine used the heat-barrier gasket between two metal gaskets fitted between the intake manifold and each cylinder head. In the first years of production, the engine had a conventional throttle body, and the electronically controlled throttle body system (Toyota’s ETCS-i system) was introduced in late 2002. From the beginning, the 2UZ-FE engine had sequential multiport fuel injection (SFI). The injection system used eight four-hole type fuel injectors (one for each cylinder), the mass air flow meter, and two air-fuel ratio sensors. The engine is equipped with Toyota’s Direct Ignition System (DIS) which uses individual ignition coils for all eight cylinders and iridium spark plugs. In addition to that, there are two knock sensors and the Electronic Spark Advance technology for management and adjustment of ignition timing to prevent knocking. The all post-2007 2UZ-FE engines are equipped with Variable Valve Timing - intelligent system, shorter name - VVTi. The system controls almost all the essential parameters of the engine: throttle position, coolant temperature, air volume, etc. According to this information, it can adjust intake camshaft timing and improve the output and efficiency of the engine at low, mid and high rpm. The second recognizable features is a plastic intake manifold with variable intake port length. The Toyota’s Acoustic Control Induction System (ACIS) controls the range. The system has two stage of intake port length: the long one is for low-engine speeds and, the short is for at higher engine speeds. Inside the 2UZ-FE VVTi engine there are new light pistons and oil jets in cylinder block to cool them. The compression ratio was increased up to 10.0:1 to burn fuel more efficient. In 2010 the 2UZ-FE VVTi replaced the old engine completely. But from 2008 the 4.7-liter engine is gradually replaced by the new 5.7-litre 3UR-FE and 4.6-liter 1UR-FE engines. 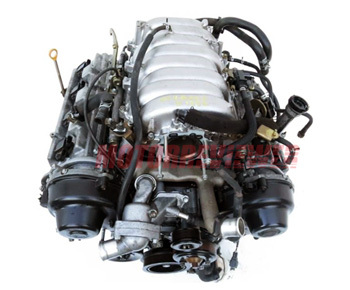 The 2UZ-FE engines are almost bulletproof, the most reliable and durable engines from the Toyota corporation. These engines do not have any design flaws, meaning lash, noise, wheezing cannot be found. The engine has a timing belt that needs the replacement every 90,000 miles. The timing belt is costly but on the other hand is a lot of extra money to repair the considerable engine disaster because of the pistons will hit the valves if the timing belt breaks. Thankfully, the cast iron block is more durable and repairable more easily. The engine longevity depends on how well and periodically was maintenance, the quality of oil and gas, driven style and conditions. But the non-problem average mileage for cars with the 2UZ-FE is about 300,000 miles.